www.photomacrography.net :: View topic - Do they feel pain as we do?? Do they feel pain as we do?? Posted: Sat Mar 08, 2008 12:41 am Post subject: Do they feel pain as we do?? I was outside and heard something falling and found this beetle lying on his back after coming off the wall. You can see the dent. When I came back and started to take pics, I noticed that his front, right hand side leg was missing a segment. I wonder if they feel the pain of the loss as we do?? I think this is one of the Psammodes beetles (Toktokkies), but cannot find a name again. Thanks Ken. An interesting answer here, one I have always wondered about even though I know a lot of insects can replace limbs which have been lost. 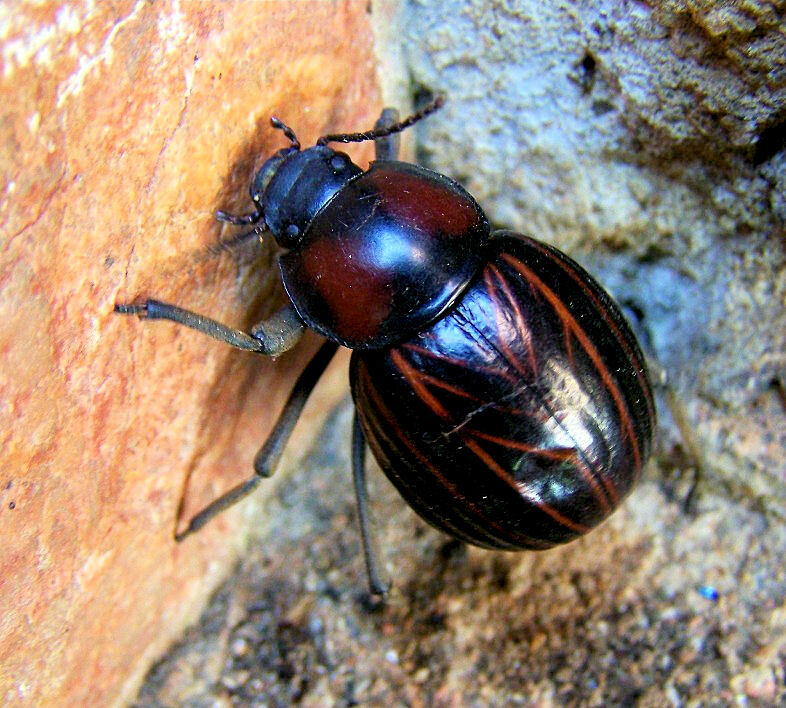 He fell from a 4 foot ledge which is a HUGE drop for such a little beetle probably equal to a hundred foot drop to us. Nice photo Joan. Beetles are such interesting subjects for study and photography. Regarding pain, Thomas Eisner dedicated a few pages (pp. 250-253) to this topic in For Love of Insects. Quite aside from the issue of consciousness, we came to the conclusion that invertebrates perceive pain, and that their sensory basis for doing so may not be much different from our own. There is therefore good reason for treating invertebrates humanely. Thanks Jay and welcome to the forum. Doug (Beetleman) in particular has a great love for beetles and I like them too. Thank you for this interesting piece of information on them. It is sad to think of them feeling any kind of pain at all as they cannot run to a doctor as we can. I wonder if they feel the pain of the loss as we do?? Nice shot and amazing colours on this Joan. Well done. Thanks Doug. I would think they do too, but like the question "Do animals have thoughts like us?" I have always wondered about it. We definitely need a true Dr Doolittle to answer these questions. For such a small critter, it was a hang of a distance to fall. Thanks Danny. How's it going down there? Heading for winter too?? I have so many lovely beetles and insects now that I will be able to post something the whole of our winter without just having to watch others post like I had to last winter. Yeah not too bad Joan. Summers are getting longer and hotter. Whether thats the global warming or something else I don't know, but we sure do like it . All the best over there Joan and keep those shots coming. Thanks Danny. I am enjoying the extended summers too. Just think, summers on Venus are around 275 degrees F. with lots of methane and probably a significant amount of sulpherous and nitric oxides in great abundance. Though I reallly don't know diddly about planetary science, I'm just running off at the keyboard. I would not mnd having summer the whole year around, but I will skip Venus thank you a bit hotter than what I like. Thanks Ken. An interesting answer here, one I have always wondered about even though I know a lot of insects can replace limbs which have been lost. This is called teratology and I once had a specimen with twin tarsi on one leg.